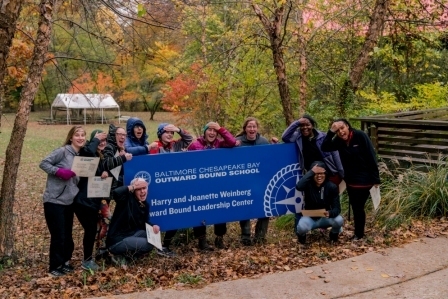 “Ships are safe in harbor, but that’s not what ships are built for,” says Leanna Powell, Fundraising Manager at Baltimore Chesapeake Bay Outward Bound School. Outward Bound has been serving the Baltimore community for 32 years. As an educational organization and expedition school, people of all ages and backgrounds participate in active learning expeditions that inspire character development, self-discovery, and service both in and out of the classroom. The Knott Foundation funded the Catholic Girls Character & Leadership Initiative at Outward Bound, which offered programs for two Catholic girls schools in Baltimore City. The partnership included Sister’s Academy, a tuition-free middle school, and Mercy High School. Nearly 200 students from these schools participated in Insight days, which include a rigorous outdoor challenge course and character education curriculum. Small groups of students from each school also participated in 5-day expedition trips – canoeing on the Potomac and hiking the Appalachian Trail. Notably, 100% of the girls participating showed gains in emotional self-efficacy, conflict resolution, problem solving, and perseverance. “Ultimately, all teens are at risk, and the window to make an impact on their development is short. What we do helps them make decisions that chart a course for the rest of their lives,” states Ginger Mihalik, Executive Director.